Founded in 1985 as a machinery repair company, MSS has developed into a well established and trustworthy safety service, which is reflected by our loyal client base. We provide a completely objective, unbiased service; designed to give you the most cost effective solution. Our commercial clients include Carillion, Nestle UK Ltd and Taylor Woodrow. We also have strong educational and local government links; including formal contracts with Warwickshire County Council and Oxfordshire County Council; to carry out the safety inspections on their machinery. The Management of Health & Safety at Work Regulations 1999 (MHSWR) requires every employer to ensure the safety of their workplace. This is particularly important in high risk areas such as machine workshops, maintenance departments and Design & Technology classrooms in learning environments. Regulation 6 of the statutory Provision and Use of Work Equipment Regulations (PUWER) states that machinery should be regularly inspected and kept in a serviceable condition. Regularly is generally interpreted as once a year. 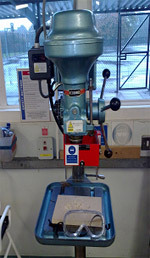 All fixed machines should be inspected; including smaller varieties such as scroll/fret saws, clockmaker's lathes etc. During an inspection, one of our team of safety engineers will examine your machinery and associated workshop environments, to identify whether or not they comply with current, relevant safety regulations/ACOPS/British Standards. An individual inspection report will be written for each machine, which details precisely where improvements are recommended and where compliance is formally acknowledged. A document that identifies how each of our recommendations relates to the safety regulations/ACOPS/British Standards. No obligation, written quotation for any upgrade or maintenance work required. You will then be included in our annual reminder system. If any of your machines require upgrade work to make them compliant with the relevant safety regulations/ACOPS/British Standards, or just need a new part, we can assist you. We can also arrange relocation of machinery and installation of any new machinery that you have purchased. All safety upgrade work is carried out on site. This could include items such as DC injection brakes, emergency stop switches, no volt release (direct on line) starters, protective sheathing / armoured flex for soft supply cable, fabrication / provision of appropriate guards (including interlocking guarding), keyswitches and electrical interlocks (micro-switches). Often, rather than trading it in, an old machine may just need a bit of TLC to get it running as good as new again. If you have a fault with one of your machines, we offer a diagnostic and repair service. Our team of safety technicians are also happy to offer free, no obligation advice over the telephone; so give us a call!